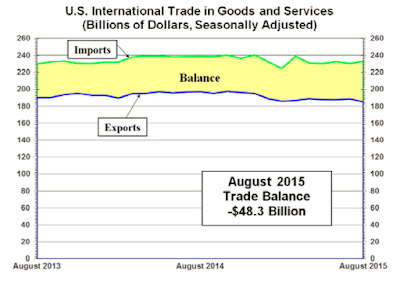 Today the US Commerce department report on International Trade in Goods and Services shows the trade deficit rose by $6.6 billion to $48.3 billion. The numbers are for August, very backwards-looking given it is now October. 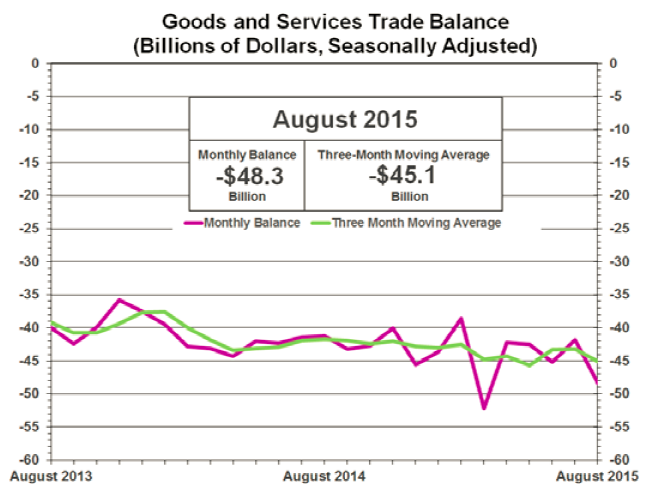 August exports were $185.1 billion, $3.7 billion less than July exports. 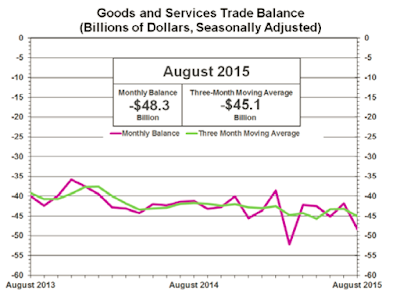 August imports were $233.4 billion, $2.8 billion more than July imports. The increased deficit was widely expected, in line with the Bloomberg Economic Consensus of -48.6 billion. A surge in imports of new iPhones helped feed what was an unusually wide trade gap in August of $48.3 billion, well up from July's revised $41.8 billion. But cell phones, at $2.1 billion, make up only a portion of the gap with a drop in exports the most salient factor. Exports were down nearly across the board including industrial supplies at minus $2.2 billion, consumer goods at minus $0.6 million, autos at minus $0.5 million, and foods/feeds/beverages at minus $0.3 million. 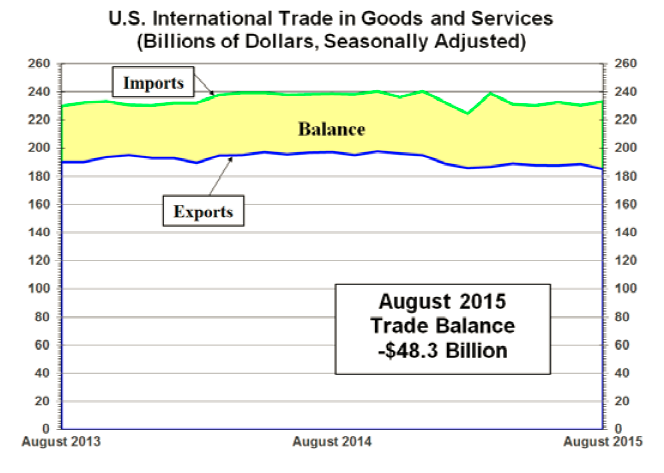 Weakness in exports reflects weakness in foreign demand together with the strength of the dollar. The goods gap came in at $67.9 billion, which is up from last week's advance reading of $67.2 billion. The petroleum gap, which is always a central factor in the nation's deficit, fell to $6.9 billion from July's $8.1 billion and reflects lower prices. Demand for the nation's services, unlike its goods, continues to climb, to a surplus of $19.6 billion vs $19.5 billion in a reflection of demand for technical and managerial services. By country, the gap with China, the main source of iPhones, rose sharply, to $35.0 billion from $31.6 billion. The gap with Mexico widened to $5.3 from $3.4 billion. Other bilateral data are mostly steady though the gap with the EU narrowed to $13.8 from $15.2 billion. Imports are a subtraction on the national accounts but are, nevertheless, a two-way street, that is reflecting demand at home which is a sign of economic strength, not weakness. Still these results will limit expectations for third-quarter GDP. Actually, this was pretty much factored into third quarter GDP estimates when the "advance numbers" came out last week. And these numbers, already way late, frequently sport huge revisions. Once again, GDP is a very lagging number.